GQWEST Inc the country’s premiere water franchising company has taken another step towards greening its operations by installing resource conservation methods in its Superstore. As part of its Green Mindset Program the company installed solar panels and a system of underground and overhead cisterns to reduce its resource consumption. The company’s Superstore located in Lincoln street Quezon City is its industrial grade water station that caters to its institutional clients like SM malls and Globe Telecom. Since it began operations, the company has been committed to reducing its carbon footprint through its Green Mindset Program. Apart from its latest initiatives the company has also been a longtime supporter of environmental NGO’s like Haribon having regularly participated with the group’s tree planting program. Under its CSV program the company offers scholarships to the children of its deserving employees. The company has always placed an emphasis in the welfare of its employees and their families. This is driven by the company’s realization that its people are its prime assets and as part of its Christian values. Since its inception the scholarship program has assisted dozens of children in getting the good education needed to succeed in their life. This year’s scholars are: Aletheia Arellano, Grade 3 at Greenfield Academy, Danica Marie Boton, Grade 10 at Fortunato Halili National Agricultural School, Jianne Rhed Catapia, Grade 4 at PBTS Academy, Mabhe Dimple Esguerra, Grade 3 at Saint Jude Academy of Quezon City, Samantha Siervo, 2nd year at Mary the Queen College, and Scarleth Jane Cayetano, Grade 3 at Merry Mount Preparatory School of Quezon City. Aquabest the country’s premier water station franchise is reaching out to its local community by opening a soup kitchen for indigent people. Every Friday afternoon the company operates a soup kitchen dispensing hot meals to the poor at its head office along Quezon Avenue. Since it started operating this February, the soup kitchen regularly serves dozens of underprivileged people. The soup kitchen is part of the company’s efforts to give back to society and is a reflection of the Christian values that underpin the company’s operations. “As a company we have to strive to make a positive influence in our community. And our efforts here however small can help our underprivileged brethren that other people still care about them” says Carson Tan the company’s President and CEO. The company was among the pioneer batch of accredited franchisors and has been recognized as a Best List brand by the bank. The company’s prospective franchisees can enjoy favorable and flexible financing terms from BPI Family Savings Bank. “Our renewed partnership with BPI Family Ka-Negosyo is a testament to our company’s hard work to building a strong brand and business that has helped our franchisees succeed as entrepreneurs. 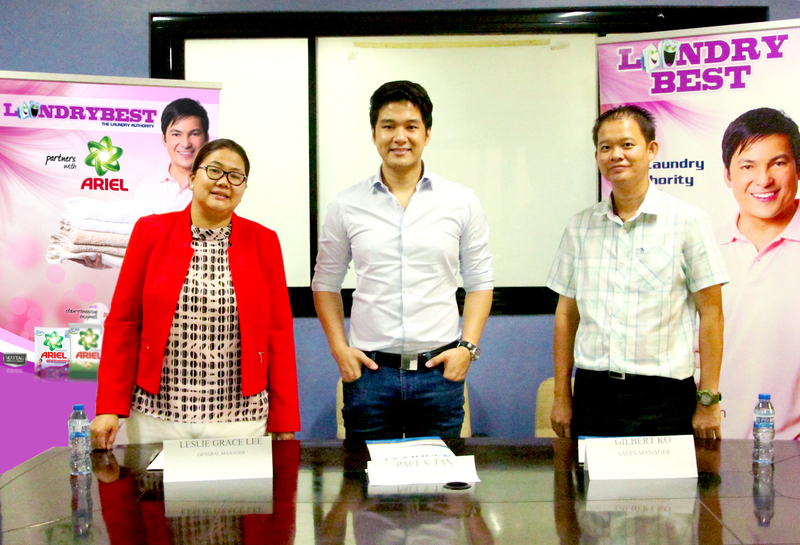 At the same time, it continues to make it easier for aspiring entrepreneurs to set up their dream business” says Carson Tan, Aquabest’s President and CEO. The seminar was conducted in cooperation with its official detergent Ariel. The seminar was facilitated by the company’s Customer Care Manager Susan Ho and Leslie Grace Lee and Eric Sto Thomas from P&G. The seminar shared business practices with its franchisees. It also covered how using Ariel products would improve the franchisees cost efficiency and product quality. The partnership is part of the company’s efforts to give added value to their franchisees and customers. “Through this partnership we can assure our customers that their laundry will be processed with the utmost care thanks to our partnership with a credible brand like Ariel” says the company’s President Carson Tan. Laundrybest is the laundromat concept attached to the company’s Aquabest water refilling franchise. At present there are 50 Laundrybest stores in Metro Manila with more set to open. GQWEST Inc. has entered into a partnership with Mazy’s Marketing Corporation that allows the brand to utilize the Ariel detergent brand for its Laundrybest laundromat brand. Under the agreement, the Laundrybest stores will use Ariel detergent while its franchisees will enjoy certain privileges like free delivery to their stores. The partnership with Mazy’s Marketing Corporation, the exclusive distributor for institutionals is part of the company’s efforts to give added value to their franchisees and to make every experience count to all its customers. “Through this partnership we can assure our customers that their laundry will be processed with the utmost care, while our franchisees can reassure their customers thanks to our partnership with a credible brand like Ariel” says the company’s President Carson Tan. Laundrybest is the laundromat concept attached to the company’s Aquabest water refilling franchise. At present there are 50 Laundrybest stores in Metro Manila with more set to open as the company seeks to capitalize on the booming property sector. 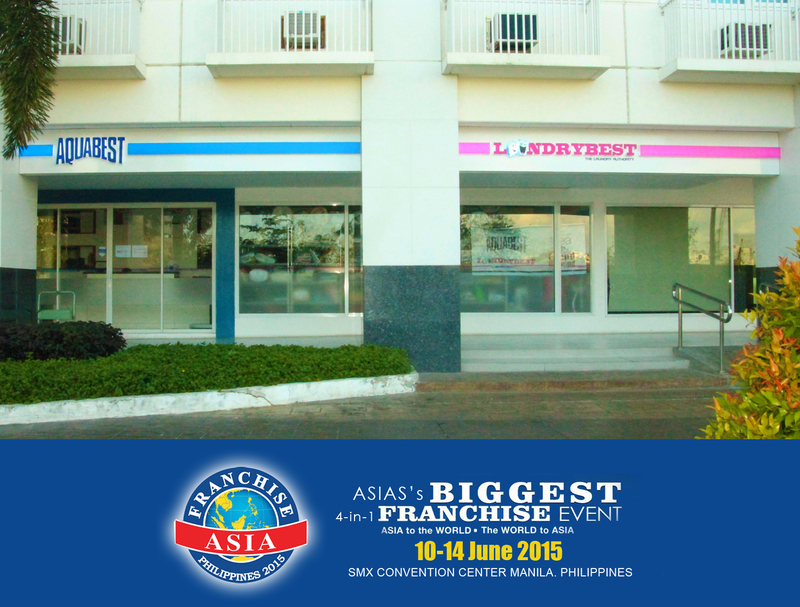 Aquabest, the country’s leading water refilling franchise is poised to launch its new condominium store format at the upcoming 2015 Franchise Asia Philippines. The company is a long-time member of the Philippine Franchise Association and is considered to be among the leading players in the water franchising industry. The company recently developed a new condominium centric store format in response to the changing trends in the market. The company recently opened two condominium based stores in SMDC developments namely SM Sea Residences and SM Blue Residences. These stores have a combined water station and laundromat setup. Compared to conventional Aquabest stores the condominium store format has a larger floor area and has an increased emphasis on the laundry business. Prospective franchisees also have reduced delivery expenses since there is a large captive market available in the respective developments that house the stores. The company has launched the new store format in response to the changing market trends. The strong growth of the Philippine property market has fuelled the growth of high density high rise vertical developments which has transformed the market.